-- Expanding in the premium-car market. -- Refocusing the Fiat brand outside of Europe, specifically in Latin America and China. -- Nearly a three-fold expansion of Jeep sales. -- Economies of scale via three key vehicle architectures. -- Virtually eliminating the company's 9.7-billion-euro net debt. Fiat brand's global sales seen rising to 1.9 million vehicles by 2018 from 1.5 million in 2013. European sales of Fiat brand are expected to stay about flat through 2018 at 700,000 vehicles. "The volumes in EMEA clearly reflect our cautious approach. In Europe the mass market brands are challenged," said Fiat brand chief Olivier Francois. "We are all realizing that notwithstanding Fiat's great European history, things have changed," he said. On Latin America sales: "In Latam, there is one objective: Stay on top in Brazil." Global Jeep sales seen rising to 1.9 million vehicles by 2018 from 1 million this year. Jeep manufacturing will expand to 10 plants in six countries, including Brazil and China, from current four U.S. plants. The company expects the Chrysler brand global sales to grow to over 800,000 units by 2018 from 350,000 units sold in 2013, "effectively returning the Chrysler brand to the volumes and share it has achieved in the past," said Chrysler brand boss Al Gardner. U.S. sales seen rising to 600,000 by 2018 from 596,300 in 2013. Alfa Romeo sales seen at 400,000 vehicles in 2018 from 74,000 in 2013. Will introduce eight new Alfa Romeo models between late 2015 and 2018. Company sees Alfa Romeo sales in N. America at 150,000 vehicles by 2018, up from none last year. Maserati sales seen rising to 75,000 in 2018 from 15,400 in 2013. Maserati revenue seen rising to more than 6 billion euros by 2018 from 1.7 billion in 2013. Maserati capex seen at more than 2 billion euros from 2014-18. "Maserati will deliver double-digit margins throughout the entire plan (up to 2018)," brand boss Harald Wester said. Marchionne said there was a "willful and intentional" plan to keep production at 7,000 to maintain Ferrari's "uniqueness and exclusivity." DETROIT (Bloomberg) -- Fiat Chrysler laid out plans for 55 billion euros ($76.6 billion) in investments to transform Alfa Romeo, Maserati and Jeep into global brands and more than double profit in the next five years. CEO Sergio Marchionne's goals also include boosting yearly deliveries for the group 61 percent to 7 million vehicles in 2018. The company forecast 2018 earnings before interest and taxes of 8.7 billion euros to 9.8 billion euros, up from 3.5 billion euros last year. Marchionne unveiled the goals on Tuesday during an investor presentation at Chrysler's U.S. headquarters in Auburn Hills, Michigan. Fiat shares fell 12 percent, the most in more than 2 1/2 years, in Wednesday trading, as analysts expressed skepticism. The shares dropped 99 cents to 7.48 euros in Milan trading, shedding 1.24 billion euros in market value in the biggest decline since Aug. 18, 2011. That pared the stock's gain this year to 26 percent, valuing the company at 9.36 billion euros. The plan envisions expanding model offerings and production capacity at Alfa Romeo, Maserati and Jeep to make them into nameplates that can attract customers from Beijing to Berlin to Boston. At 9:25 CET on Wednesday, Fiat Chrysler shares, which had risen 44 percent since Fiat announced on Jan. 1 it would take full control of Chrysler, were down 8 percent at 7.78 euros. "While extremely favorable market conditions, which we doubt, and flawless execution could allow Fiat to reach some of its operating targets, one figure that we believe even the bulls will have trouble justifying is the 2016-18 deleveraging," Exane BNP Paribas analysts said of the target to almost erase debt. George Galliers, car analyst at International Strategy & Investment, said it was difficult to process the 10-hours of presentations Fiat Chrysler made to investors. "Yesterday was a very long day for us as Fiat took investors through another five-year plan in excruciating detail. At this very early stage it is a struggle to see how all the elements presented can add up to a coherent whole," he said. The new business plan is a critical step in Marchionne's decade-long effort to turn Fiat into a carmaker big enough to challenge General Motors Co., Volkswagen Group and Toyota Motor Corp., following the completion of the purchase of the rest of Chrysler Group in January. VW, the world's second-biggest carmaker, is targeting sales of more than 10 million vehicles in 2014, while Toyota, the global sales leader, is forecasting deliveries of 10.32 million. Reaching 7 million should move Fiat Chrysler up at least one rung on the global sales rankings, Marchionne said. Fiat's expansion is focusing on rebuilding Alfa Romeo, with plans to invest 5 billion euros through 2018 to bring out eight new vehicles and increase deliveries more than fivefold. The marque has the potential to help drive profit for the group, in the same way that Audi does for VW, by commanding higher prices than mass- market models with the Chrysler, Dodge or Fiat badges. Alfa will develop new rear-wheel-drive and four-wheel-drive vehicles and aims to boost sales to 400,000 in 2018 from 74,000 last year. The brand will continue to build all its models in Italy and will begin rolling out the new vehicles at the end of 2015 when a new mid-size car comes to market. Alfa will ditch the current Mito compact as part of the overhaul. Maserati will increase annual deliveries more than fourfold by 2018 to 75,000 and expand its model offerings to six, including adding the Alfieri sports car, shown this past March in Geneva. The brand aims to more than triple revenue in the next five years to more than 6 billion euros. Maserati will invest more than 2 billion euros to push growth. Jeep aims to more than double deliveries by 2018 to 1.9 million sport-utility vehicles, with the number of dealers worldwide rising 28 percent to 6,023. The brand, which last month received approval to begin production in China, plans to eventually produce SUVs at 10 factories in six countries. Marchionne is also planning to boost sales at the group's mass-market brands, with the Fiat nameplate's annual deliveries set to rise 27 percent to 1.9 million in 2018 and the Chrysler badge more than doubling to 800,000. Marchionne said he will run Fiat and Chrysler until the end of the plan in 2018, two years longer than he said he would stay in January. The need for the reorganization was underscored after Fiat reported a 1.4 percent decline in first-quarter earnings on Tuesday. Trading profit fell to 622 million euros. Fiat will need to come up with the money for the investments against a backdrop of mounting debt, which the automaker forecasts will rise to 10.3 billion euros by the end of the year after the acquisition of Chrysler. Available liquidity at the end of 2013 was 22.7 billion euros. The carmaker said that it's keeping open its financing options, while ruling out a capital increase before 2018. Marchionne said Fiat doesn't plan any "divestiture" to finance the plan, ruling out the sale of any unit. At the same time, a "mandatory convertible bond is not off the radar screen" after shares of the new entity, Fiat Chrysler Automobiles, are trading in New York. The CEO targets completing the merger of the Italian and U.S. carmakers by the end of 2014. 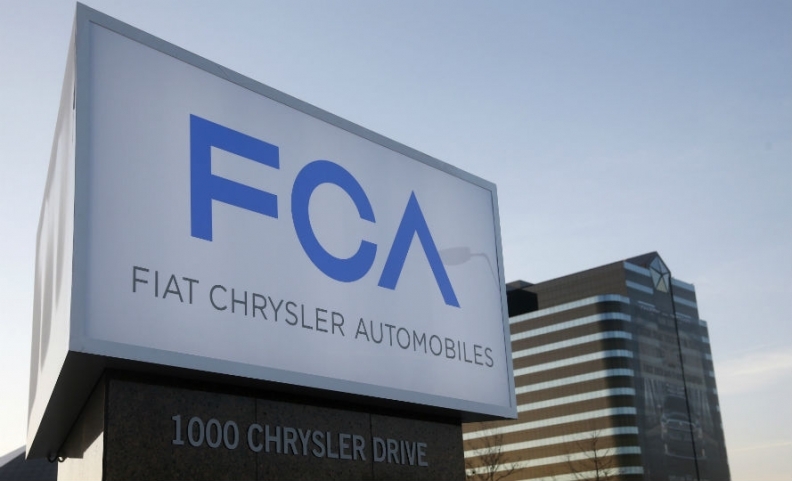 Fiat Chrysler will have its main stock listing in New York while it will be registered in the Netherlands with a fiscal domicile in the U.K. for tax purposes. Fiat started accumulating Chrysler stock in 2009 as part of a rescue of the U.S. carmaker following the global recession. Without the division, Fiat would have been unprofitable in 2012 and 2013 because of losses in Europe. Exor SpA, the company that controls Fiat with a 30 percent stake, would invest more in Fiat if it was needed, said John Elkann, chairman of Fiat and Exor. "I wish I had more" of Fiat, Elkann said. "Sergio doesn't want more capital."